Today's growing organisations need to be able to coordinate a great deal of information. Every business division, from materials management, production and finance, to HR, sales and marketing, needs to know exactly what action needs to be taken, where, and when. In order to make the best use of your organisational resources, you need a comprehensive Enterprise Resource Planning (ERP) software solution that can act as an organisation-wide control centre. This 'control centre' will collect status information and progress reports from different divisions and make them available to other departments. Information is updated by the users in real-time and accessible at any time to anyone who needs it. 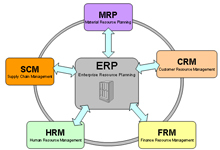 Many organisations do not need the complete range of functionality available in the typical ERP suite. These suites are therefore usually offered in a modular format, allowing companies to implement only the modules they need, and to add more later if required. Oracle also provide a wide range of industry-specific modules, incorporating best practice functionality and processes for a specific industry sector.